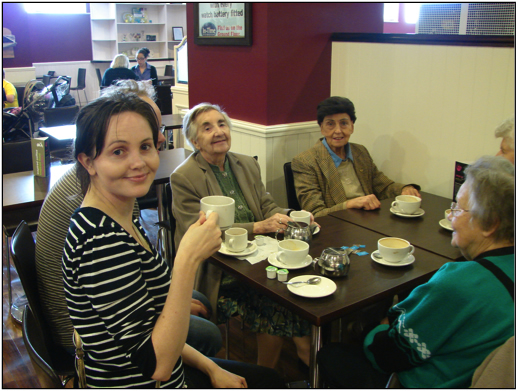 The Wednesday group has between 6 and 8 attenders, it adapts to meet the needs of the attenders, but is based on sharing thoughts and feelings, reminiscing and coming together to have a laugh. Attenders have the opportunity to talk about their past, revisit troubles if they need to, and share their worries about the present. Skilfully facilitated, attenders are able to support each other. We chat together, using photos and books to reminisce, and sometimes discussing some aspect of the past which is common to all the members of the group. We sometimes prepare and share lunch which is usually sandwiches or salad and pudding with custard. Care is taken to make sure everyone feels useful and involved with the group, whether slicing cucumber, setting the table or grating cheese. The comments reflect the feelings of a group of people coming together for mutual support, and having a lot of fun along the way. Many attenders appreciated being able to take part in preparing lunch and washing up. This helps people feel more fulfilled, particularly women who may have spent their lives nurturing and caring for others. Peoples sense of self can be reinforced, to counteract the effects of dementia where it can feel that this is being eroded along with the ability to remain active and useful. 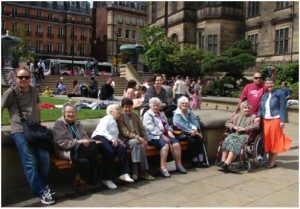 The Wednesday group enjoying the sunshine in the peace gardens.